For years, VELCRO® Brand construction fastening systems have provided a greener option for manufacturers, architects, and builders – to create sustainable solutions for their building needs – and even helping earn potential LEED green building rating points. The VELCRO® Brand has recently partnered with Carlisle SynTec Systems to create a sustainable, revolutionary, adhesive-less roofing solution – RapidLock™ Roofing System – allowing for quicker installation in all weather conditions, to help save both time and labor. 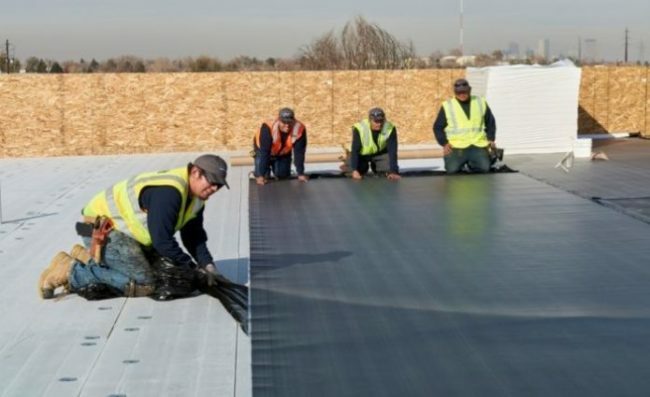 Established in 2017, the RapidLock (RL) Roofing System is an adhesive-less system that uses VELCRO® Brand Securable Solution™ Products to fully attach Carlisle’s RL roofing membranes to RL insulation without the use of an adhesive. VOC- and odor-free, with no application temperature restrictions, this solution can be installed in any weather conditions, enhancing the experience for installers and contractors who can feel confident that they will remain on-schedule with their installations, whether on occupied or non-occupied buildings. Our fastening solutions reduce the use of volatile organic compounds (VOCs), eliminate adhesive off-gassing, and reduce job site waste. Such applications can be completed in a wider range of temperature and weather conditions for improved productivity and reduced labor costs. The RapidLock system was recently awarded Best Commercial Product at the 2018 International Roofing Expo.